I am very thankful for my life, family and friends. I'm also very blessed to have great souls in my life. Those who have been the unconditional and unwavering cheerleaders through the varous chapters in my life. Those who understand and support me and my aspirations. For that I am beyond grateful. In the words of one, let's rock this! Onto the food... The plan was candied yams and pumpkin pie. But after speaking with Jacklyn, who made a good point that candied yams though traditional aren't such a popular item, I opted for a savory version of sweet potatoes. I'm glad I did. Both the roasted sweet potatoes as well as the pumpkin pie were a hit. There was only one slice of the pumpkin pie left and there were two other pies on the table! I really wish I took photos of our spread because it was insane... lobster bisque, jumbo shrimp, turkey, ham, pulled pork, roast beef, asparagus, mashed potatoes, corn, and the roasted sweet potatoes. For dessert, pecan pie, apple pie, the pumpkin pie, strawberries with melted chocolate, grapes, cherries, oranges. The pumpkin pie was done just in time so I didn't get a chance to take a photo before I left the house. It looks like a pumpkin pie should except I topped it with sliced pecans. 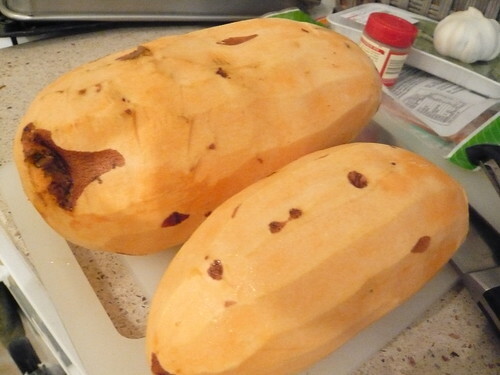 I combined two recipies I found online for roasted sweet potatoes. 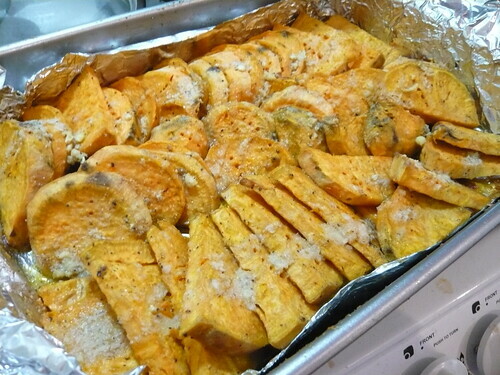 The result: roasted sweet potatoes with garlic oil, salt, pepper, and fried sage leaves. required some banging on the cutting board to cut haha. 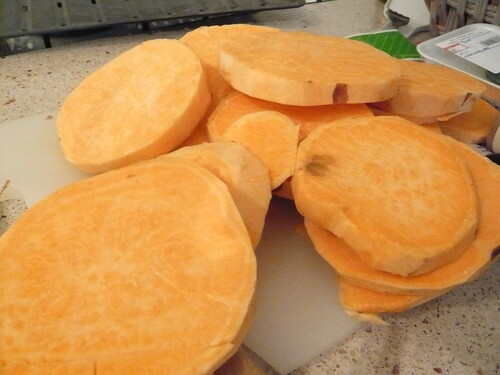 Though not quite visually appetizing, the wrinkly-ness means the sweet potatoes are done. I added the fried sage leaves later to maintain crispiness.